The commonly used acronym “IDK” stands for the phase “I don’t know.” Claflin graduate Jordan Coburn wants the people who wear his clothing line Ignorance Driven Knits — idk for short — to say that they do know about what’s going on in the world. Coburn says the latter is his call on America to wake up to the international issues affecting us all. He cites the wars in Iraq and Afghanistan, coupled with the Iranian nuclear threat impacting the price of gasoline, as an example. After graduating May 12, Coburn, a marketing major, traveled home to New York to expand his idk brand. He says the learning experience he gained at Claflin will prove invaluable in promoting his burgeoning business. “It will definitely assist with learning my demographics and in advertising via social media,” Coburn said, adding that his minor in graphic design was instrumental in constructing the clothing design. 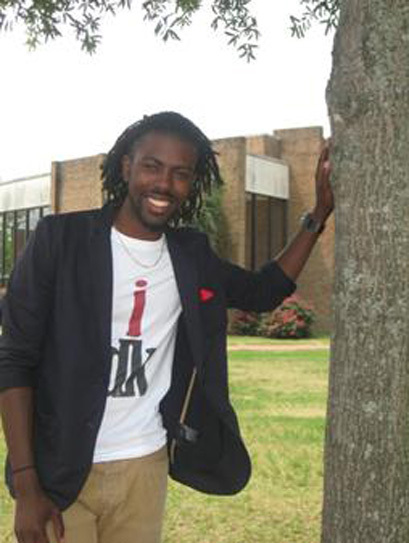 Aside from the clothing line and serving as Mr. Claflin 2011-2012, Coburn was a member of the university’s track and field team, attended the Alice Carson Tisdale Honors College, served as a student tour guide, and was captain of the En Veux Modeling Company and a member of the Kappa Alpha Psi Fraternity Inc. The genesis of idk began when Coburn’s adviser, digital design instructor Frederick Tookes, encouraged him to move forward with his clothing business in February. Coburn originally wanted to make T-shirts for Greek organizations, but realized his audience would be minimal. “I realized I wanted to impact everybody. So I went to something inspirational,” he said. Coburn said he tries to counteract ignorance with creative designs featuring inspiring and motivating statements. He aspires for the idk brand to encourage people to research real world issues and their direct impact on themselves. He plans to network with other fashion designers and attend trade shows to further his business. He also plans to produce hats and bags in the future, he said. “Hopefully in 2013, it will be a name you recognize,” Coburn said.